In metulis: liquamen porrum concisum cuminum passum satureiam uinum; mixtum facies aquatius et ibi mitulos quoques. Translation: For mussels: fish sauce, chopped leek, cumin, raisin wine, savory, wine; add water to the mixture and cook the mussels in it. Italy is a peninsula: the Romans took full advantage of this, and ate a lot of fish. To reflect this, I decided to follow a pretty classic modern menu progression and have fish between my egg and meat courses. As I mentioned in my post on the whole Ides of March dinner I concocted for Foodbuzz 24×24, Roman food focuses heavily on a few flavors, so it wasn’t too hard to keep flavors in line between courses. The tough part, in fact, was finding dishes that varied and didn’t just lump on the fish sauce, vinegar, and honey. I might toss some clam juice in next time, but I don’t particularly see the need, since this was absolutely amazing with only the four ingredients pictured above. The sweet wine brought out and highlighted the sweetness of the mussels, rather than overpowering it. The cumin added a lovely note of complexity, and the leeks brought freshness. Mussels in white wine? No longer my go-to. These were even good enough to get my vegetarian friend James to take a brief excursion into pescetarian waters. Because my guests had a variety of dietary needs and preferences, I tried to avoid courses that were only fish or meat. Thankfully, Romans served veggies in early courses of a meal (unlike modern Italians who serve “contorni” with or after the meat course), so I served some light vegetable dishes alongside the mussels. Boletos fungos: carenum, fasciculum coriandri uiridis. Ubi ferbuerint, exempto fasciculo inferes. Translation: Mushrooms: wine, a bundle of green coriander. When they have boiled, pull the bundle out and serve. Caroetas: sale oleo puro et aceto. Translation: Carrots: salt, pure oil, and vinegar. 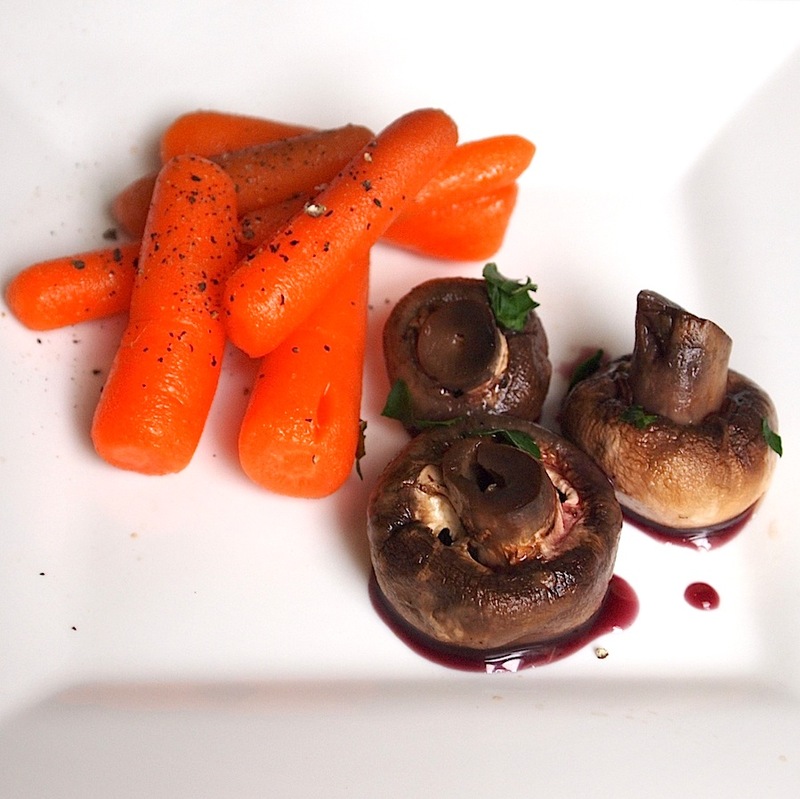 The carrots are actually supposed to be fried, and the mushrooms to be boiled with the wine. To keep these light and salad-like, though, I boiled the carrots and served them room temperature with an oil-and-sherry vinegar dressing. I tossed the the mushrooms in oil and roasted them to keep things simple. I found it kind of fun to just toss a bundle of coriander into a half bottle of wine and infuse. To keep the coriander from getting messy I bundled it in cheesecloth. All of these dishes were wonderfully simple. 1. Combine all ingredient but the mussels in a tightly lidded pot big enough to hold the shellfish. Bring the liquid to a boil. **If your mussels were pretty clean, serve the broth as is. If they were sandy, reserve some of the leeks and strain the broth through cheesecloth to remove grit before serving. 1. Preheat the oven to 350 degrees. Toss the mushrooms in the oil and place them in a single layer in a pyrex baking dish. Roast them for 20-25 minutes until tender. 2. 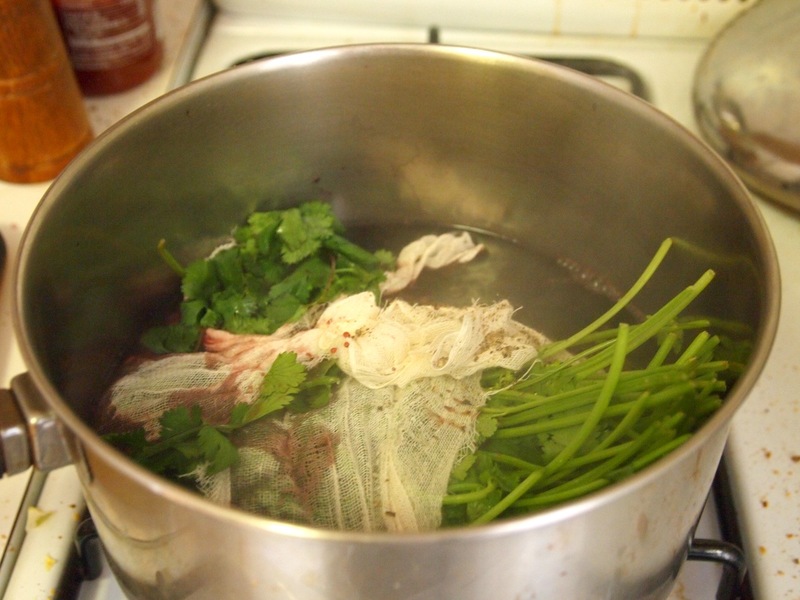 While the mushrooms are cooking, add coriander, salt, and pepper to the wine, bring the mixture to a boil, then turn down the heat and simmer for 10-15 minutes until the wine has reduced to about 2/3 the original volume and the coriander is totally wilted. 3. Toss the mushrooms with the wine and serve hot. The wine will have a herbal flavor. 1. Boil the carrots in salted water until tender (about 7-8 minutes). Drain and let cool to room temperature. 2. Rub the garlic around the inside of a small metal bowl, then add the oil and vinegar and whisk together with desired seasoning until fully blended. Toss the carrots with this dressing and serve. Love your blog! Beautiful pictures and great ideas! I don’t cook with seafood often enough. Now that I live on the coast, I think that I should remedy that! Thanks for the inspiration, although mussels totally weird me out 🙂 Maybe some nice fish? I’ve never made mussels at home before but this recipe sounds absolutely divine! I love anything cooked in wine! 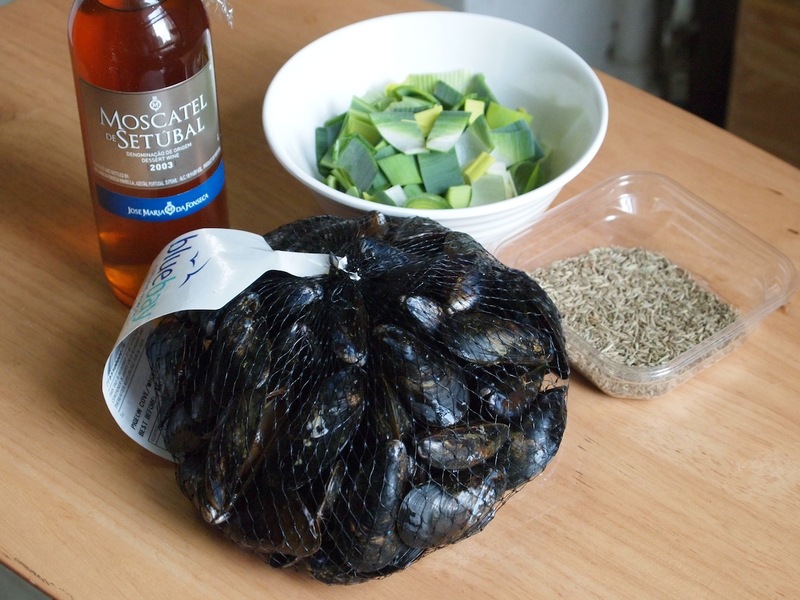 I have never had mussels but this preparation might just change that.